TYR Convoy Elite Transition Backpack – A triathlete’s view. With a triathletes need to transport three sets of kit to races on a regular basis, having a bag that can do this and provide separation for all of the disciplines would help to simplify an already stressful situation. TYR have answered this call with the Convoy Elite Transition Backpack. With a large 30 x 15 x 15in storage area separated by 3 internal mesh dividers it conveniently stores all of your kit so that you know where to find everything based on the swim, bike and run elements. The backpack is designed to open up like a tool chest, presenting all of your gear to you in easy access compartments preventing the need to dig from the top down to find those elusive items. Once opened the three sections make it easy to separate swim, bike and run gear with plenty of space for each discipline. There is also an excessive number of zipper pockets within each sections for smaller items that you don’t want to lose, which ironically can lead to wondering if you actually packed everything. An external mesh compartment positioned on the front of the backpack is used to securely store your helmet, this saves internal space which isn’t used up by bulky head gear. This along with two external bottle pockets help to save more space and provides easy access to nutrition. A separate removable wetsuit bag will ensure your kit remains dry after your race, which conveniently clips to the outside of the backpack using the carabiner provided. Once packed and ready to transport, the backpack design does work well, the rear panel is supported by a metal frame and padding across the shoulders, mid and lower back provide a comfortable fit. There is a height adjustment available to suit smaller and taller athletes and the shoulder straps are further adjustable ensuring even distribution of weight can be achieved correctly. Most bags don’t require instructions on use but the Convoy would benefit as there is so many straps and compartments to use, without these it can take a while to decide on the many options for kit placement. TYR recommend swim kit in the bottom section, bike next and run at the top but it really is up to the individual. This trial and error packing did highlight a small issue. Once packed, checking quickly that you haven’t left items out becomes an event in itself, there are 5 straps and the main Velcro opening to navigate to gain access to the main compartment. This isn’t convenient if you are in a hurry. What the backpack does do well is provide a triathlete with a convenient solution for race day organisation. It works well where it counts, in the transition area. 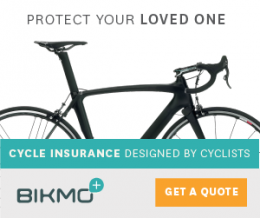 The bag can be stored flat under the racked bike out of competitors way, post race attire will remain dry inside the rugged, water resistant nylon material which performs well keeping out adverse elements. No more lugging plastic boxes to transitions balanced on your tri bars hoping the contents don’t spill out while the marshal is checking your helmet and race numbers are attached correctly. Once you get to grips with the myriad of compartments this bag really does work well for transporting all of your chosen kit to races or open water sessions. As long as you keep a check of what you have packed and there is no need to unpack multiple times, this would make a welcome addition to race day to reduce stress and faffing. A quick search of the net today meant I found this for under £80 meaning that you will pay a lot less than the standard RRP making this bag even more value for money. 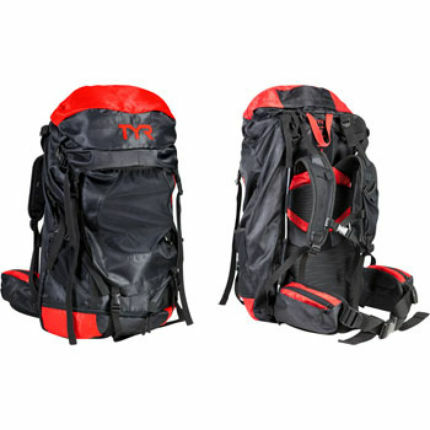 The TYR Convoy Transition Backpack is available in Black and Red.